If JSConf EU was a startup it had a $118 million per year burn rate – luckily we only do run it for 2 days of the year but that still leaves us with the terrible (We love all of you. Thanks for trusting us to put on the show!) job of having to spend $650k in 48 hours– and with the event being volunteer run, we literally mean that we spend every last penny on something that is happening on those 2 days. Image from JSConf EU unrelated to this post but with lasers. We like to set the tone for the rest of the event in the first few minutes. There is usually something on the schedule called keynote that isn’t a keynote but it sounds good and makes people show up. The key to setting the tone is to really surprise people so they open their mind for the 2 days of brain massage that is ahead of them. Surprise means to do something that can’t easily imagined from the baseline of having attended the previous years which drives us onto an escalation path in terms of production value and organizational complexity. This is the part that I enjoy about running a conference: Every year I can start fresh without any legacy code and worrying about backward compatibility and do something that is as awesome as I can be this year. The core idea for 2014 came out of this video: 3d projection mapping onto moving screens held by giant robots. There is nothing more JSConfy than that. At some point I had to realize that the giant industrial robot part would most likely not fly in our not-so-giant venue, but the 3d projection mapping was here to stay. The thing I had in my head was to open the conference by literally turning on the room – making every surface participate in a boot sequence. I asked my friend Nikolai Spreng, who has been helping with party and conference visuals since we started in 2009 whether he’d know anyone who could do it and his recommendation was to talk to lichtinstallationen.com. 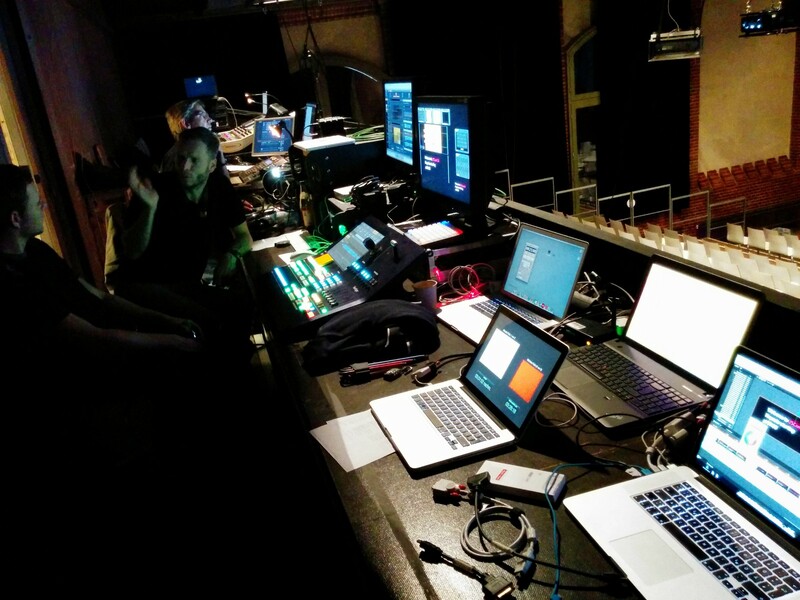 Audio, lights, projection mapping and projection control. Since forever the tech briefing for our AV provider was: Get the best projector money can rent. We switched to Berlin company audio & frames this year and I was nicely surprised that they did literally that – only they got 2 of them. 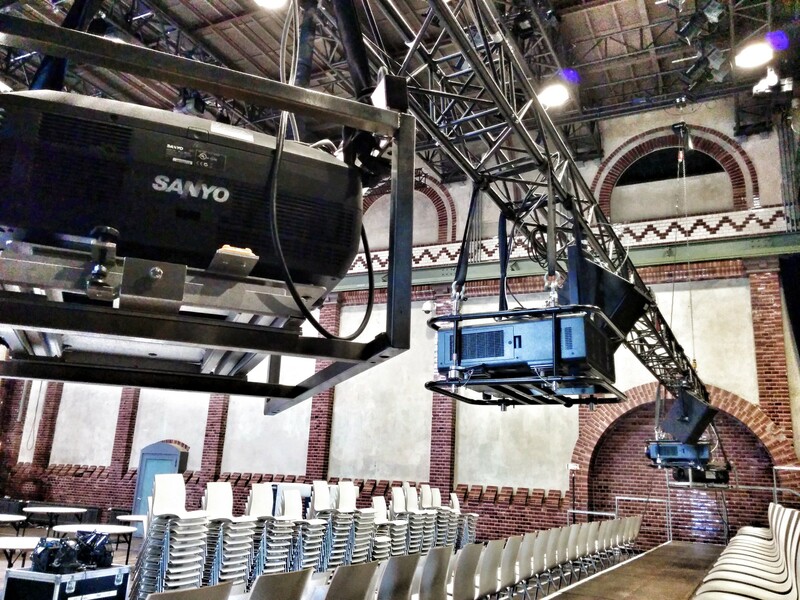 The main projectors 1 and 2 are Panasonic DZ21K in array configuration where they act as a unified screen with their actual projection area slightly overlapping creating a native resolution of 2880x1200 pixels. Our speakers had the option of going full resolution but the default was to mix a 1080p presentation onto the available canvas with the rest being filled by the projection mapping. Projectors 3 and 4 are 2007 era but almost equally powerful Sanyo PLC XF47 positioned on the sides and aimed at the opposite walls and part of the backdrop. These are used only for the projection mapping, so fidelity isn’t as important as for the main projectors that display speaker material. All 4 projectors would then be integrated into 1 unified projection mapping of the back wall and about 20% of each of sides making those 100s of square meters usable as a single screen. For the 3d mapping itself our 2 artist then spend the better all of the afternoon before the conference in painstakingly drawing the room’s primary wireframe model into the real, heavily distorted (from the 2 side projectors aiming in a funky angle onto the walls) by literally walking around while aligning the mouse pointer with the edges and corners found on the real walls. This combined with a rough 3d models of the room in which the projectors are positioned as cameras then allows the mapping software to project into the room so that the walls appear to be displays themselves. Let people into the room with the lights being bright, so people can find their seat – maybe a little brighter so that if we turn them down the effect is more dramatic. Play signature “The Audience Is Programming” video. This year just in simple letters. Start 3d mapping with playback song. Slowly turn up the room. Then put text editor for music live coding on main screen. Now turn on stage lights, so people can see that an actual person, Jan, is on stage coding the song. As guitar sounds emerge turn on another light to make Stuart visible. Overall using projection mapping in a conference venue turned out to work much better than expected. It made the venue which is interesting in itself even more amazing, added subtle value to conference sessions and made those sessions with elaborate visuals a truly immersive experience (Giving these startup pitch weasel words actual meaning: Do you have 3d projection mapping? No? Then your iPhone app is not an truly immersive experience.). For me personally having seen how it works in a conference setting, I couldn’t be more excited to use the technique again based on that experience to make everything 10x better. Here is to 2015. 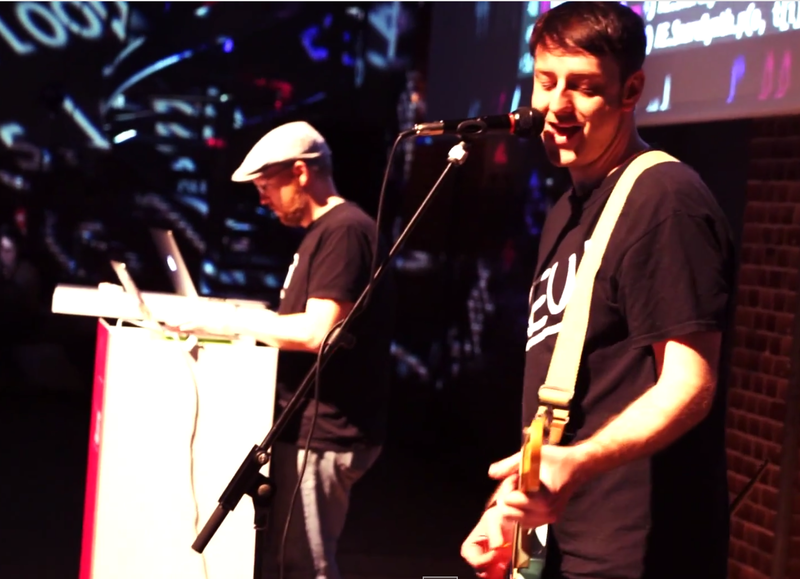 P01 presenting at JSConf EU 2014. Projection mapping on side wall. Illuminated spiral stair case on left side of the stage.